Congress appears set to override President Trump’s order last month to freeze federal civilian employee pay in 2019, as multiple plans to increase employees’ wages this year gain momentum. Last year, efforts by Senate appropriators to provide civilian federal workers with a 1.9 percent pay increase in 2019 fell apart amid a dispute over whether to include funding for a wall along the U.S.-Mexico border, despite the fact that House Republicans had agreed to include the pay raise measure. And in late December, Trump finalized his plan to freeze civilian pay with an executive order. Last week, in announcing the plan to end the 35-day partial government shutdown, Trump said a conference committee would be formed to negotiate on the Homeland Security spending package, which suggested that accord had been reached on other areas of government currently funded through a three-week continuing resolution. Indeed, a Democratic House appropriations aide confirmed Monday that both the House and Senate have agreed to a 1.9 percent pay raise for 2019, something senators have said could be applied retroactively to Jan. 1. Meanwhile, some House lawmakers have begun to push for a bigger goal: pay parity. 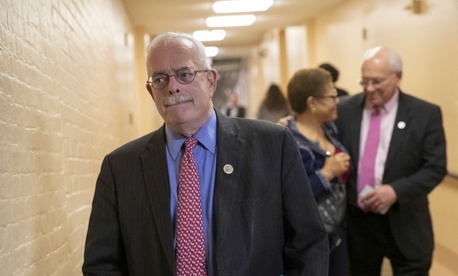 Last week, Rep. Gerry Connolly, D-Va., and House Majority Leader Steny Hoyer, D-Md., introduced the Federal Civilian Workforce Pay Raise Fairness Act (H.R. 790), which would provide civilian feds with a 2.6 percent pay increase in 2019, also retroactive to Jan. 1. That would bring the increase in pay in line with the raise approved last year for members of the military. And late Tuesday, a group of Democratic Senators—Chris Van Hollen and Ben Cardin of Maryland, Mark Warner and Tim Kaine of Virginia, and Brian Schatz of Hawaii—introduced legislation to provide federal employees with a 2.6 percent cost of living increase. Traditionally, Congress has approved measures to provide pay parity between the government’s civilian and military workforces, although in 2018, service members received a 2.4 percent pay raise, compared to only 1.9 percent for civilian federal workers. The House Rules Committee met Tuesday to deliberate on the bill, and Hoyer slated the bill for a vote on Wednesday. With Democrats in control of the chamber, it is likely to pass, although its fate in the Senate is unclear.